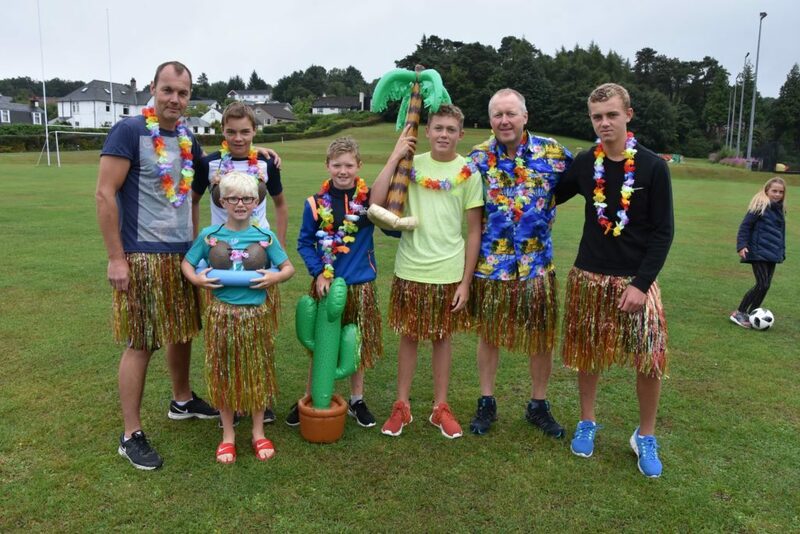 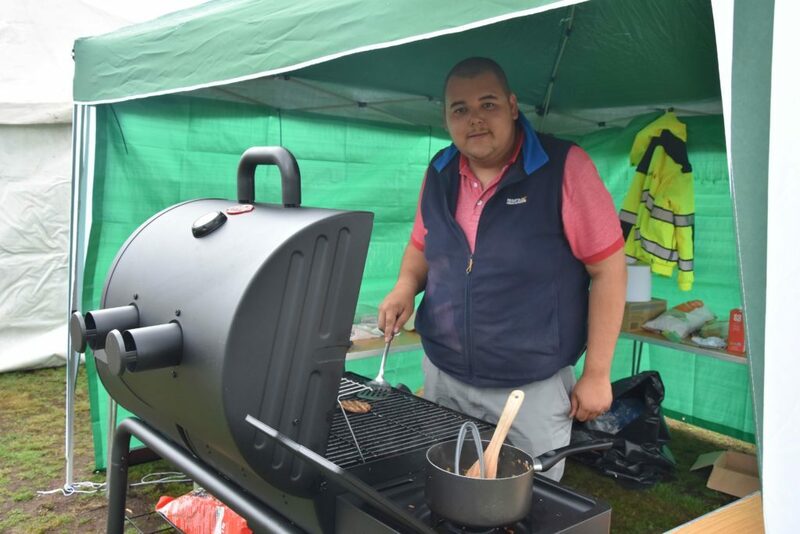 Despite torrential rain in the morning, the fancy dress cricket fun day at the Ormidale Park in Brodick went ahead as scheduled with a committed group of cricketers dressing up and taking part in an afternoon of six a side cricket. 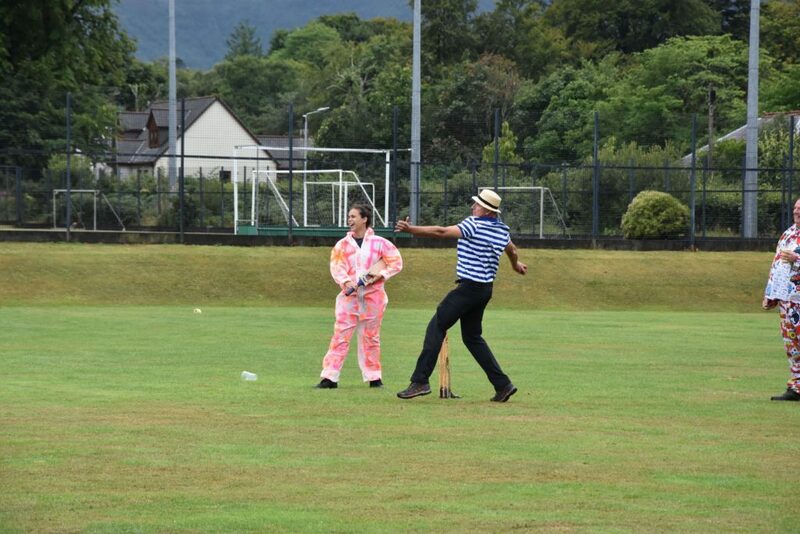 Organised by the Sannox Cricket Club the more-fun-than-competitive event places the emphasis on the enjoyment of the game with a generous helping of absurdity and silliness. 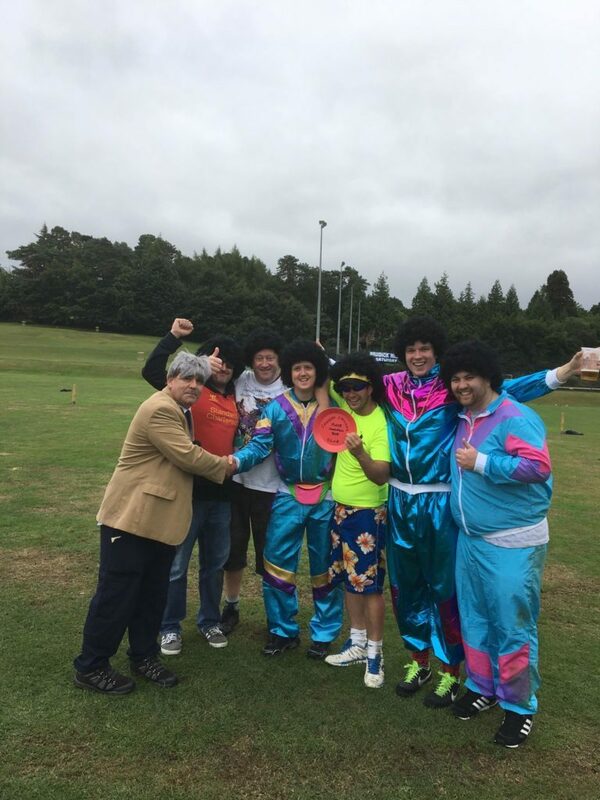 Raucous commentary, outlandish music and equally ridiculous outfits were the order of the day. 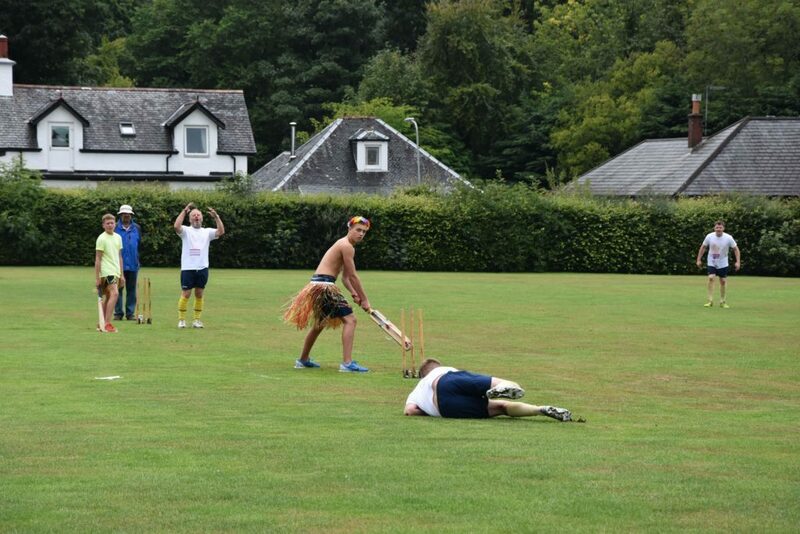 Rules were made up as the event progresses and the only statutory requirement was that players and supporters have fun. 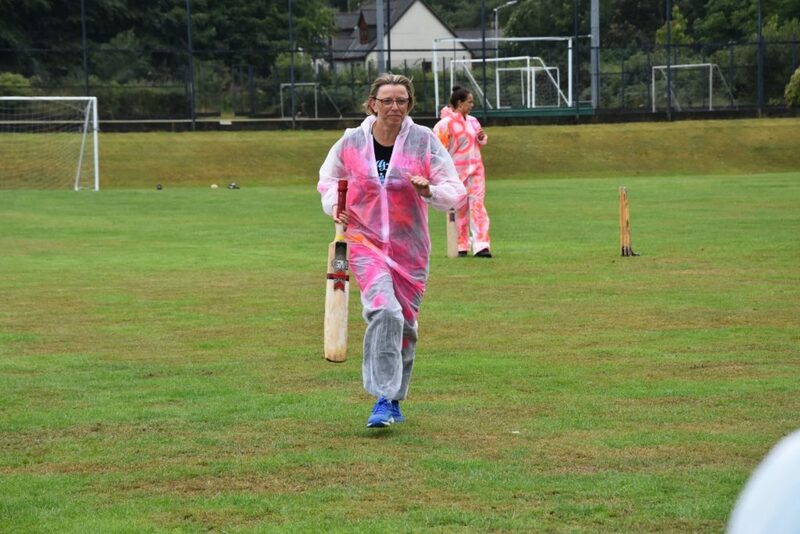 In total there were five teams with one later forming a splinter group to create another, known as Team Six, they were knocked out just before the semi-final round. 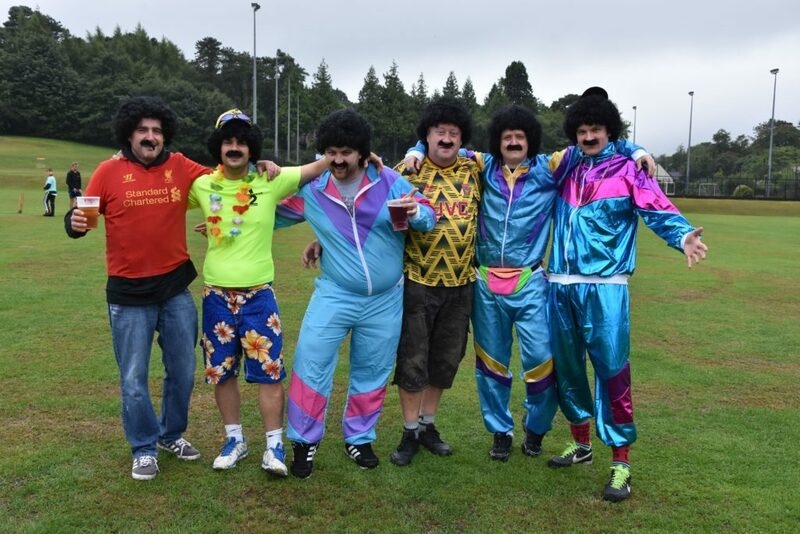 Most outlandishly dressed team undoubtedly went to Team Ian Rush Fan Club who wore brightly coloured garish tracksuits with 1970s style moustaches that required constant stroking. 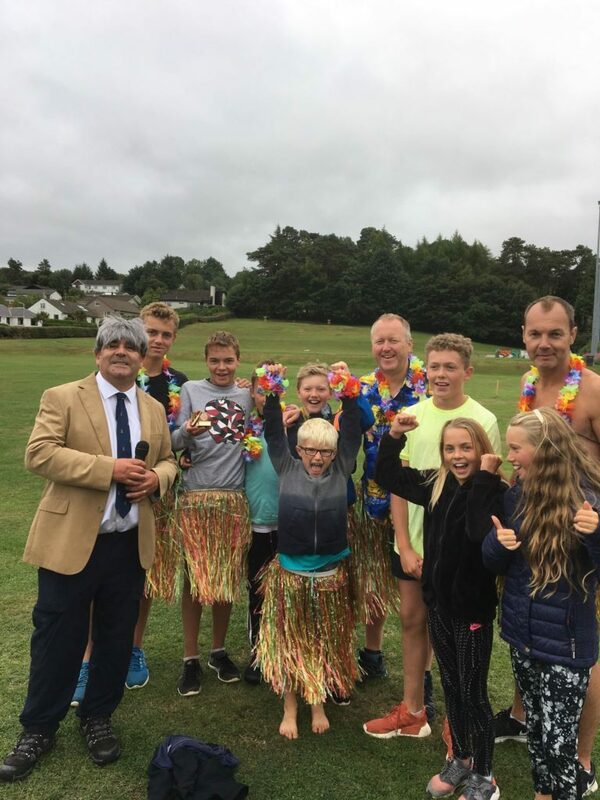 Team Wild Boars FC were possibly the best suited for the rainy conditions while team Hawaii Five-O might have been hoping for sunshine in their grass skirts and Hawaiian flower necklaces. 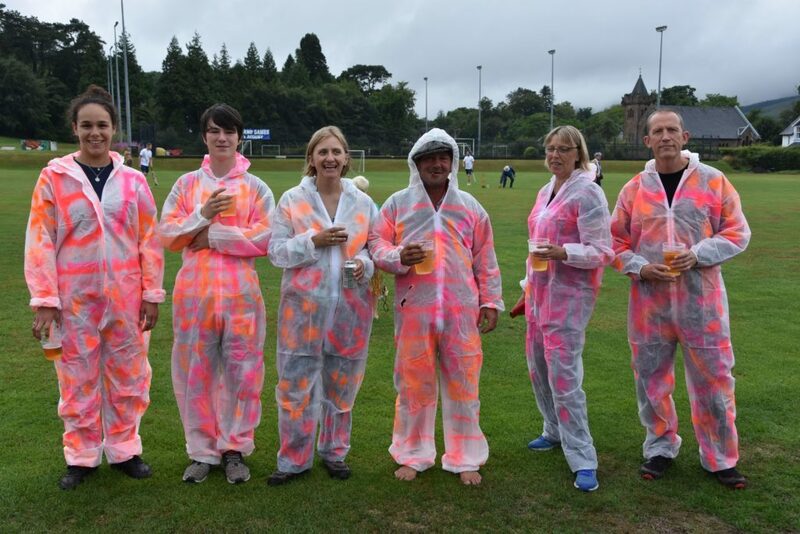 Veterans of the event, and true to their name, team Borderline Functioning hastily arranged within minutes of the matches starting, to assemble a team of players who undoubtedly were the brightest on the filed with their spray painted coveralls. 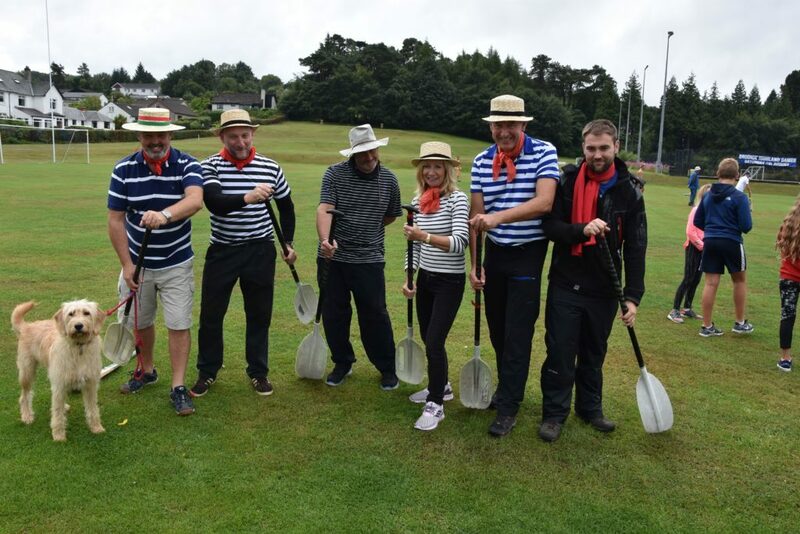 The luminous colours contrasting with the elegant team known as The Gondoliers who came well prepared with oars and straw hats. 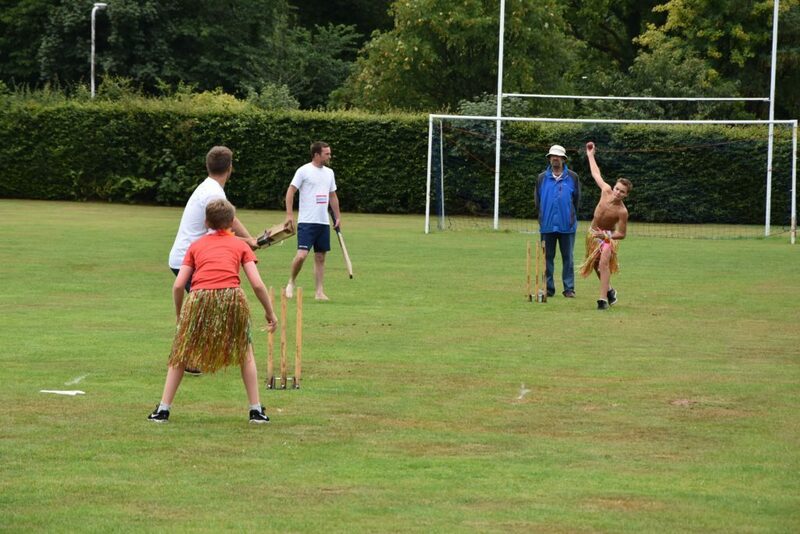 On the field the action continued with enjoyable cricket matches, humorous commentary and well-matched music. 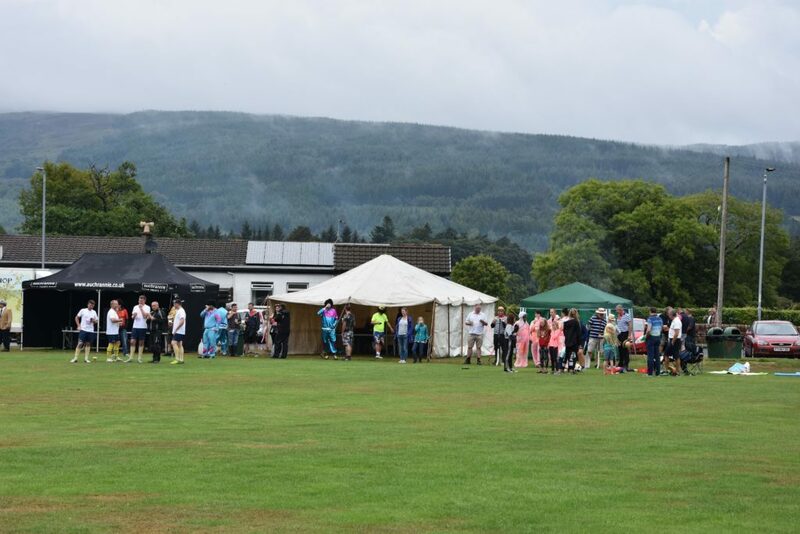 Off the field the bar tent did a reasonable trade considering the number of visitors brave enough to venture out while the burger stall, as usual, was kept busy from the start to finish. 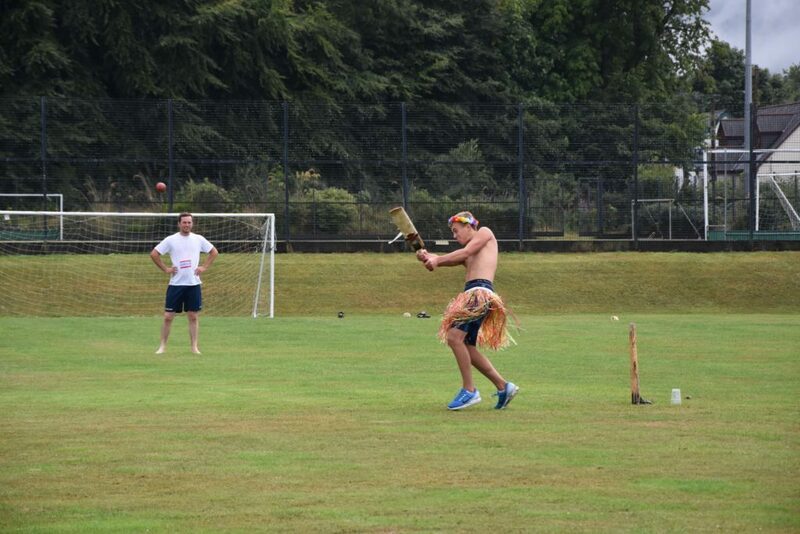 Not that the results mattered much to the players, the overall winners were team Hawaii Five-O who defeated team Wild Boars Football Club in the final. 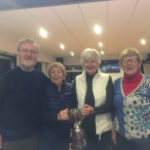 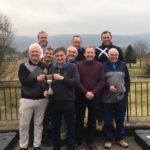 In the plate final, Ian Rush Fan Club beat The Gondoliers to win the coveted plastic plate award – a red plastic plate engraved with the tournament name in black plastic marker pen.